A proudly flying Danish flag, en route to our morning appointment. We began the last day of our journey at a reduced number of five members. Corey and Brandon both had to depart early in the morning to catch their flights back to the US. Undeterred, we prepared to visit the last two churches on our itinerary: Jesuskirke in the morning, then Trinitatis Kirke in the afternoon. The walk to Jesuskirke was an hour long, but it passed by pleasantly with perfect weather. Along the way, Chris Porter regaled us with tales of hiking adventure in Patagonia, Mt. Kilimanjaro, and others. We made it to the church well on time for our appointment, and Sven Verner Olsen, the resident organist at Jesuskirke, welcomed us inside. Jesuskirke was built by Carl Jacobsen in 1891. Son of a wealthy beer tycoon, Jacob C. Jacobsen, Carl's own success in his father's industry earned him a jealous disownment. Upon his father's death, Carl received one million Danish kroner, and he used a portion of the bequeathed funds to establish the Jesuskirke. Though it serves the Church of Denmark, Jesuskirke almost looks like a Roman Catholic establishment at first blush. 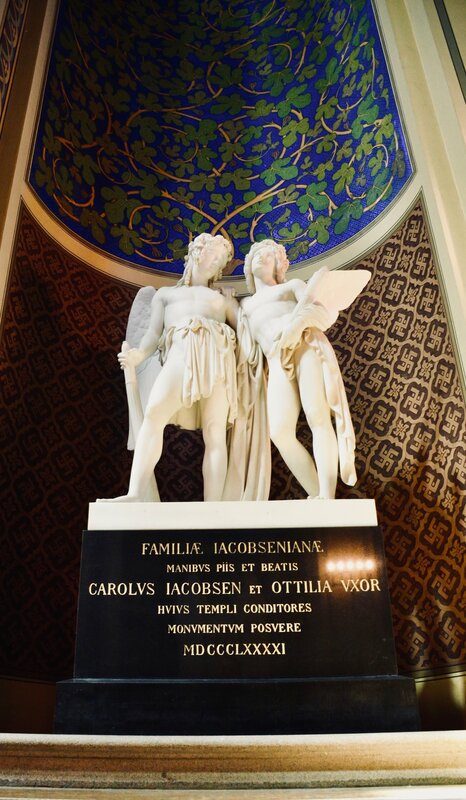 Latin quotations by Roman historians Tacitus and Suetonius adorn the entrance to the building, and beautiful marble statues stand in the sanctuary. We learned that Carl Jacobsen was an admirer of the antiquity and endeavored to imitate an Italianate style. The 1890 Cavaillé-Coll organ in Jesuskirke, Copenhagen. Sven Verner Olsen demonstrates one of Jesuskirke's 46 harmoniums. Interestingly, Jesuskirke also hosts a large number of harmoniums. The first of these instruments was donated by Carl Jacobsen himself, and the church simply accrued more and more over time. The experience of finding a harmonium at every turn was quite amusing. Sven joked, he traded an organ with 46 stops for 46 harmoniums when he took his post at Jesuskirke. 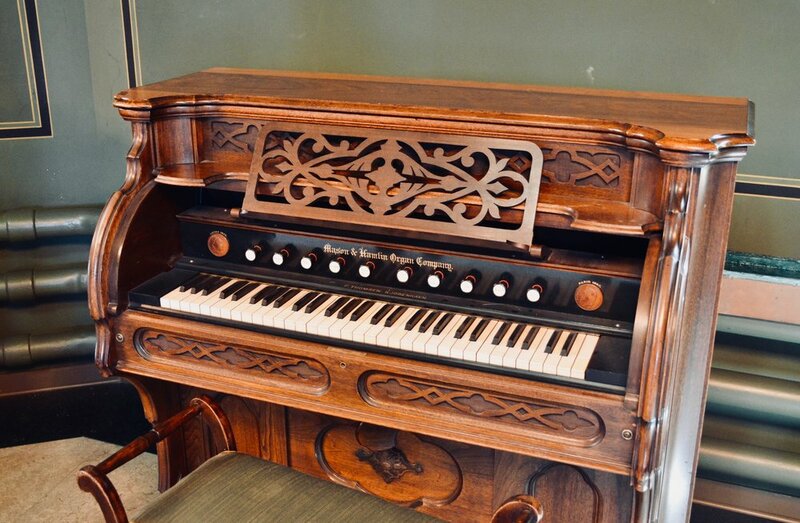 The harmonium is a unique instrument to play with its non-stop pedaling action. Nuanced and accordion-like expression is possible by adjusting the speed and force of pedal air supply. As I'm a fan of the accordion, it would be great fun to have a harmonium around back home in Boston. Our business at Jesuskirke finished, we took a lunch in Carlsberg before returning to the center of Copenhagen. Carl Jacobsen's influence is felt everywhere around here; we had an excellent meal at "Carls Madhus". The organs of Trinitatis Kirke, Copenhagen. Then it was time for our final appointment, and we were greeted by Søren Christian Vestergaard at Trinititas Kirke. The church is quite old, dating back to the reign of Christian IV. The tower was completed in 1642 and the church followed in 1656. The church was unfortunately consumed by a large fire in 1728 but was reconstructed after only 3 years in the Baroque style. 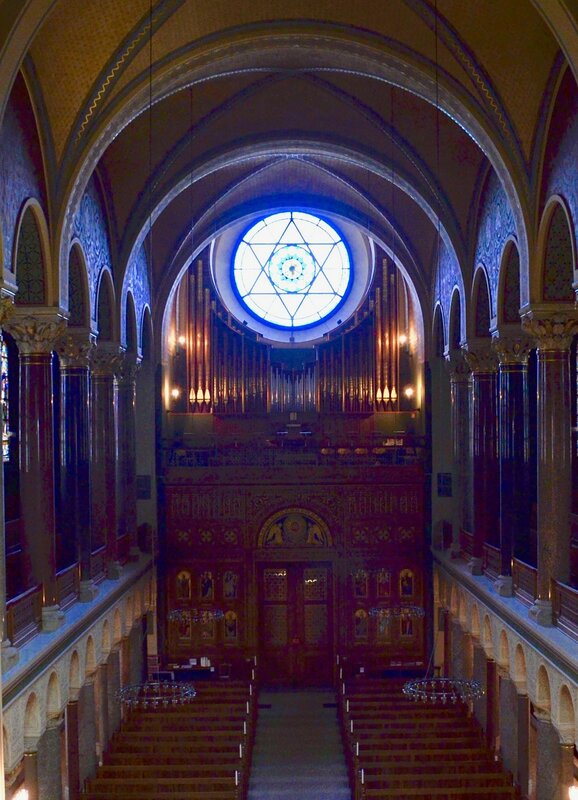 The three manual organ in the back of the sanctuary is not historic, though its facade is the original from 1733. Its pipes are mostly modern, with a few from 19th century. Adrian Cho pumps (pulls) the bellows of the Italian baroque organ in Trinitatis Kirke, Copenhagen. The true star of this visit, however, was a small Italian Baroque organ on the side of the loft. The instrument is reported to be from around 1780 and the pipes are close to 100% original. Similar to many other historic instruments we've seen on this trip, it uses a meantone temperament and tuned slightly higher to 460 Hz. Despite its diminutive size in comparison to the main organ, the Italian organ is able to fill the sanctuary with remarkable vigor. While outfitted with a modern electric blower, its true qualities are only revealed when the bellows are operated manually. The uneven air flow gave the instrument an organic sound, and Sweelinck's Hexachord Fantasia sang gorgeously with a human-like voice- a true delight! A view over Copenhagen, as we end our trip atop the tower at Trinitatis Kirke. The day wound down with a climb to the top of church tower, the Rundetaarn, where Denmark's first topographic survey was carried in the 1760's. The panoramic vista of Copenhagen atop was fantastic. We sat, enjoying the view and sharing a contemplative moment. After a pleasant dinner out, the night ended quietly to to rest for a long journey home tomorrow. 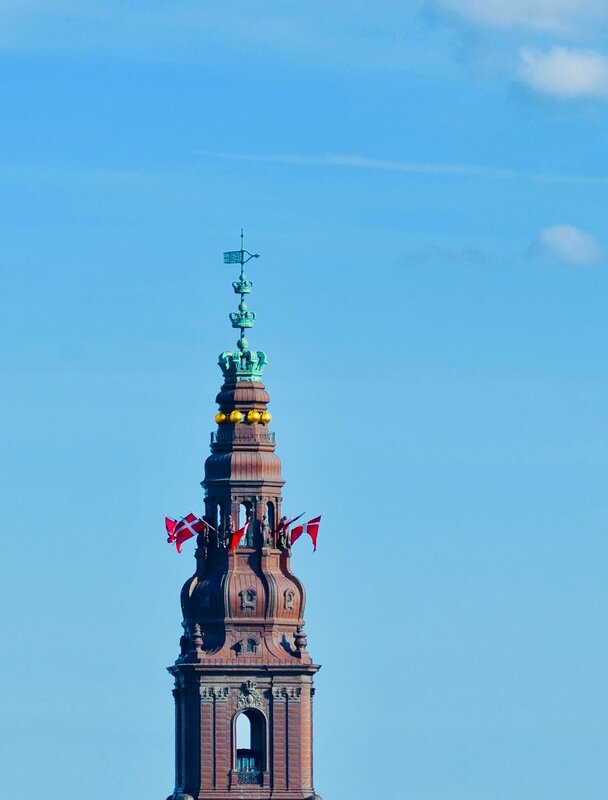 A Danish flag flies proudly in Copenhagen. 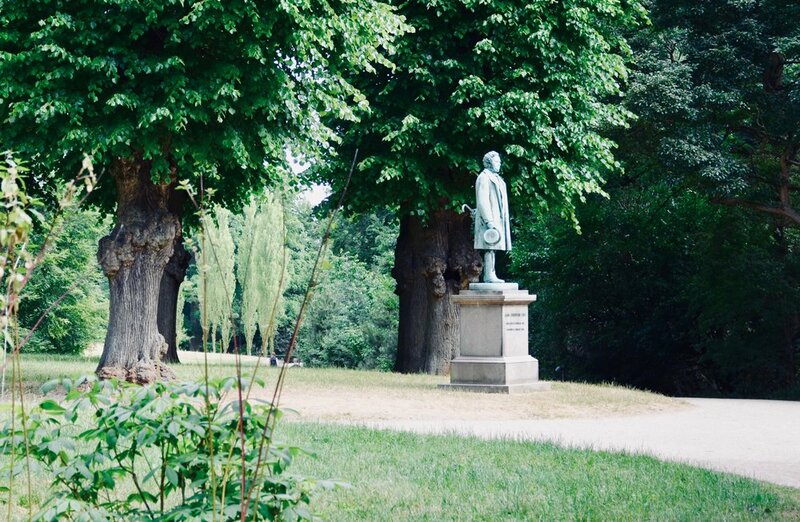 Passing through a park on our way to Jesuskirke, Copenhagen. 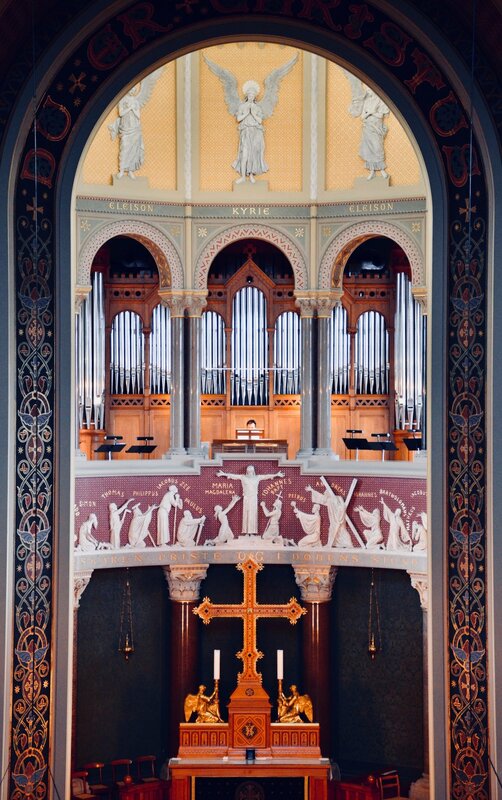 The 1890 Cavaillé-Coll organ of Jesuskirke, Copenhagen. Sven Verner Olsen introduces the 1890 Cavaillé-Coll organ of Jesuskirke, Copenhagen. The modern rear-gallery organ in Jesuskirke, Copenhagen. Sven Verner Olsen demonstrates one of Jesuskirke’s many harmoniums. Keydesk detail, harmonium at Jesuskirke, Copenhagen. 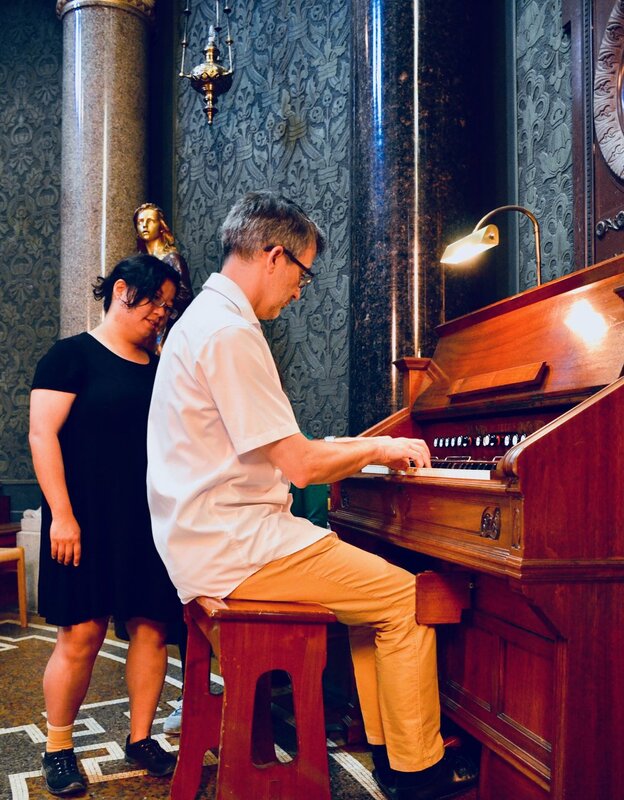 Sven Verner Olsen assists Jennifer Hsiao at the harmonium, Jesuskirke, Copenhagen. 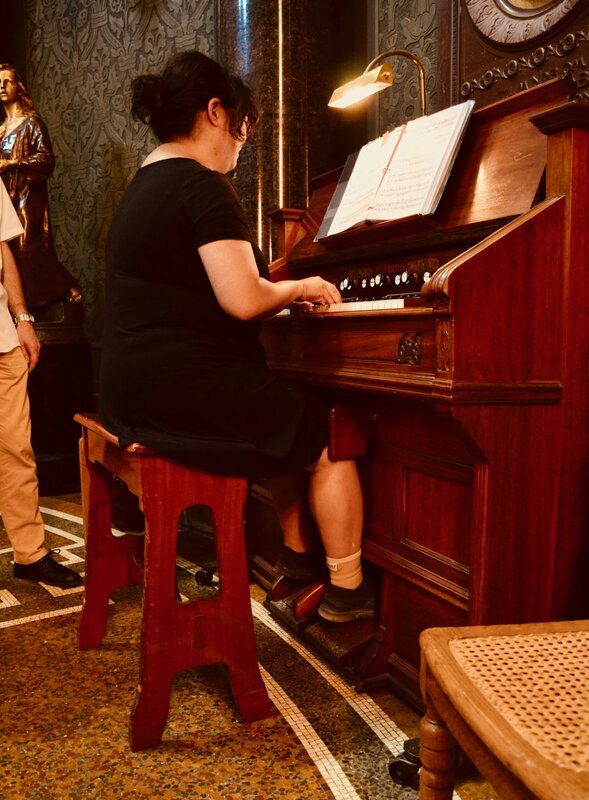 Jennifer Hsiao tries out one of the many harmoniums in Jesuskirke, Copenhagen. 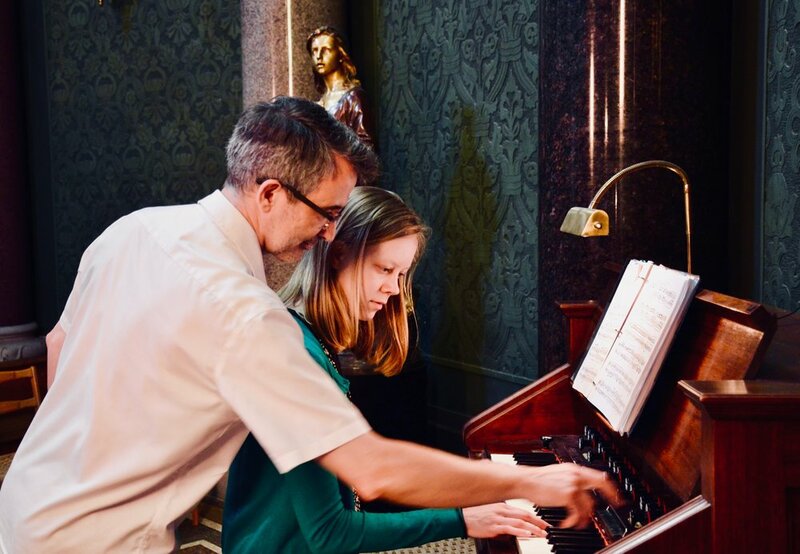 Sven Verner Olsen assists Laura Gullett at the harmonium, Jesuskirke, Copenhagen. One of the harmoniums of Jesuskirke, Copenhagen. Nameplate detail, 1890 Cavaillé-Coll organ, Jesuskirke, Copenhagen. 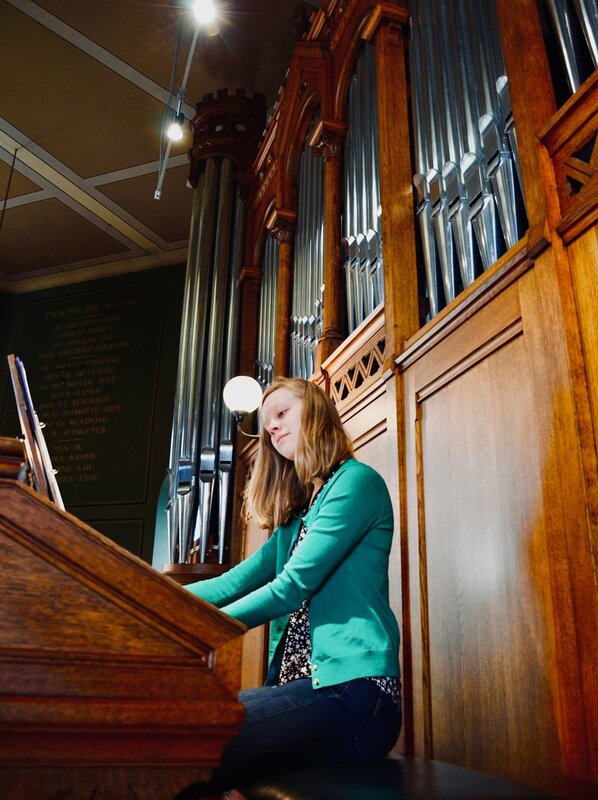 Laura Gullett plays the 1890 Cavaillé-Coll organ, Jesuskirke, Copenhagen. 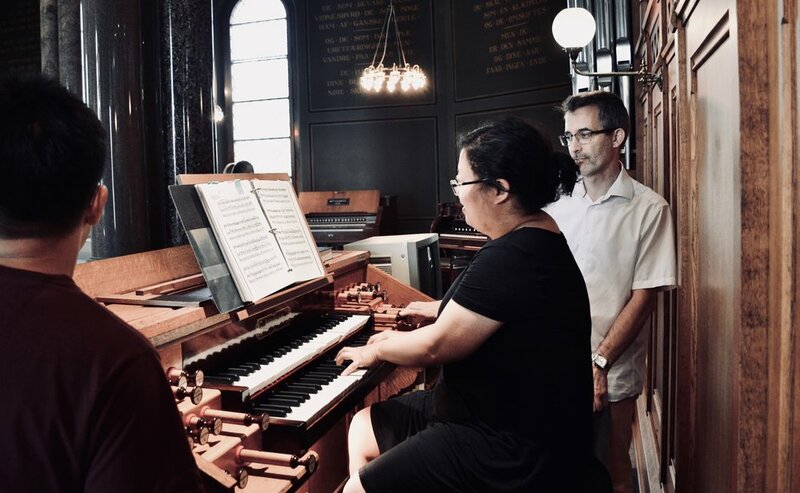 Jennifer Hsiao plays the 1890 Cavaillé-Coll organ, Jesuskirke, Copenhagen. Sven Verner Olsen shows details of Cavaillé-Coll pipework at Jesuskirke, Copenhagen. 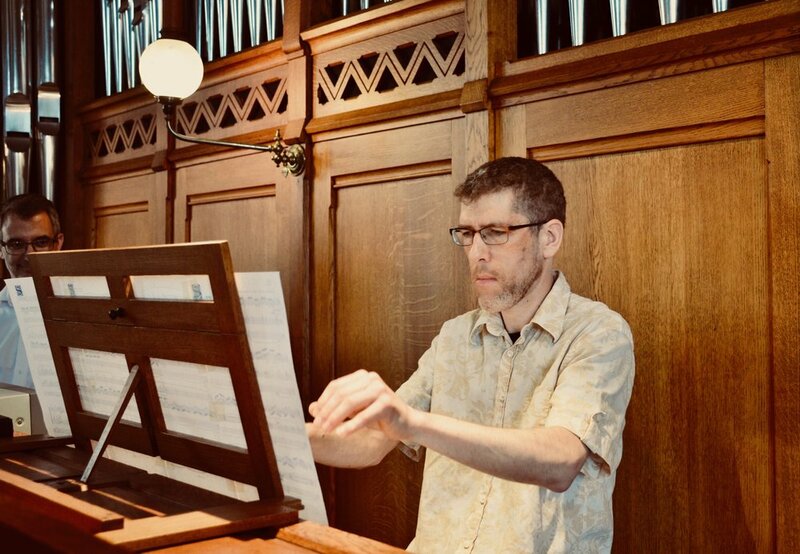 Chris Porter plays the 1890 Cavaillé-Coll organ, Jesuskirke, Copenhagen. The modern rear-gallery organ, Jesuskirke, Copenhagen. 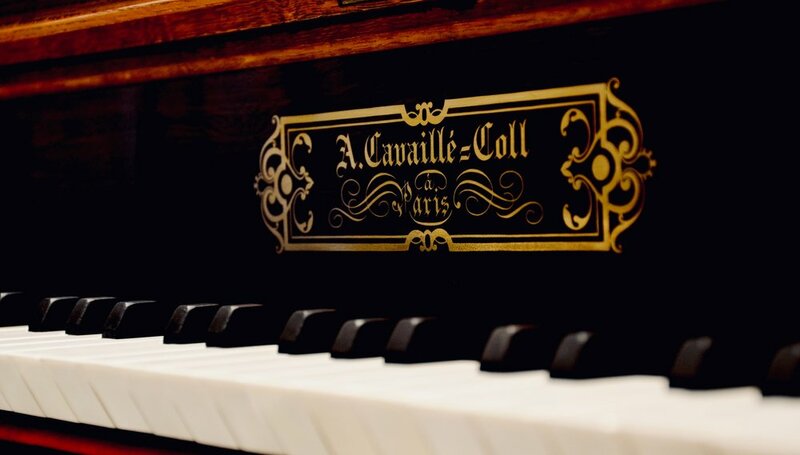 1890 Cavaillé-Coll organ, Jesuskirke, Copenhagen. 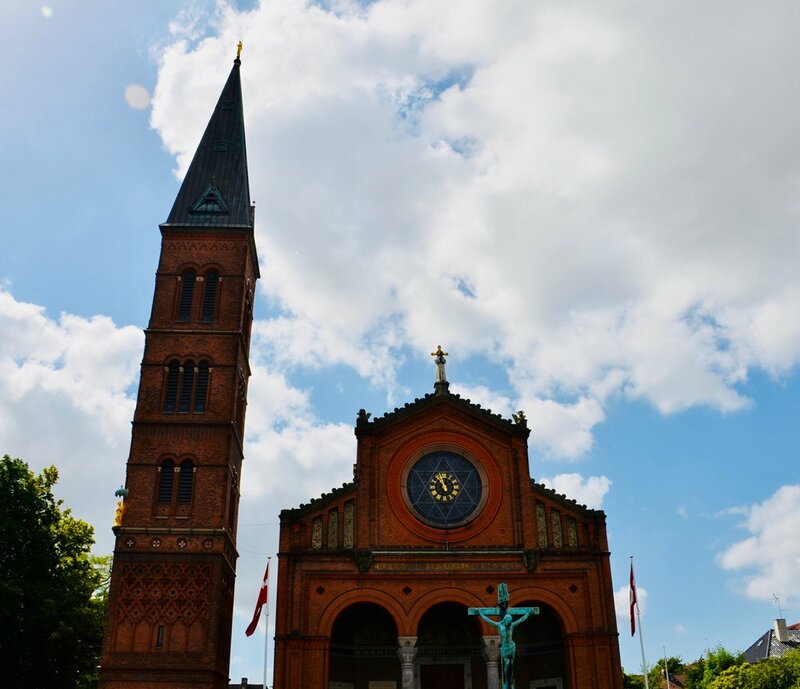 The tower of Trinitatis Kirke, Copenhagen. 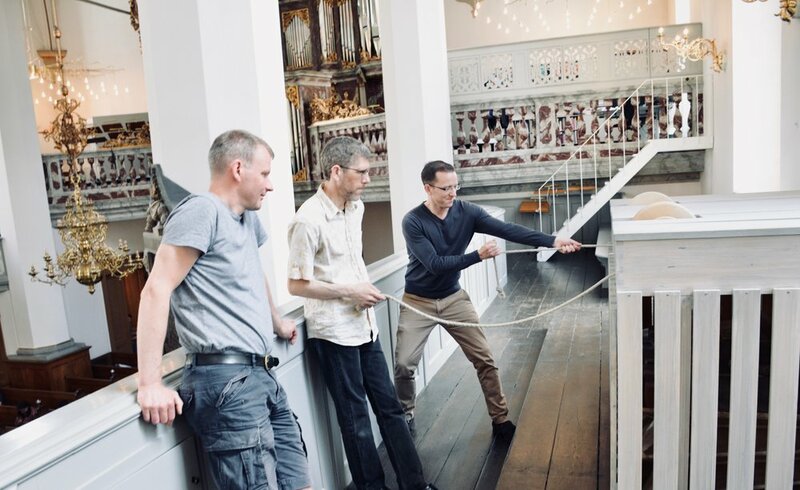 Søren Christian Vestergaard introduces members of Boston Organ Studio to the instruments of Trinitatis Kirke, Copenhagen. 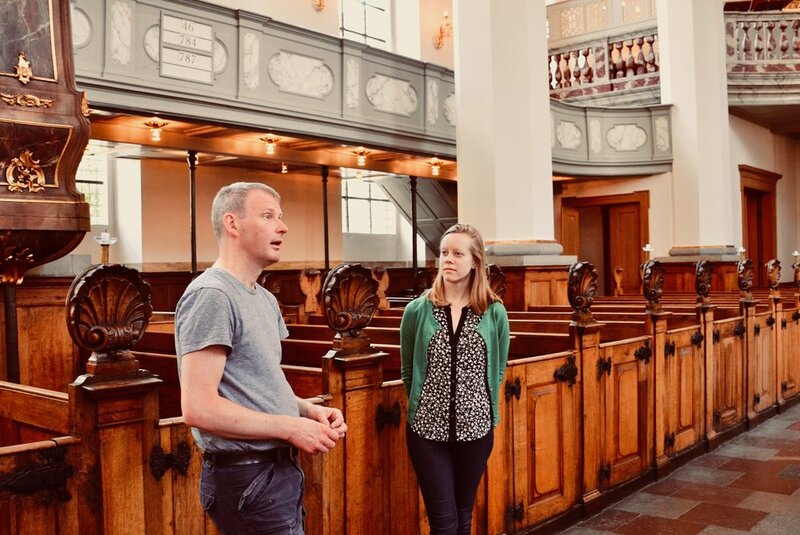 Søren Christian Vestergaard introduces members of Boston Organ Studio to modern choir organ in Trinitatis Kirke, Copenhagen. The modern choir organ of Trinitatis Kirke, Copenhagen. The Italian baroque organ in Trinitatis Kirke, Copenhagen. 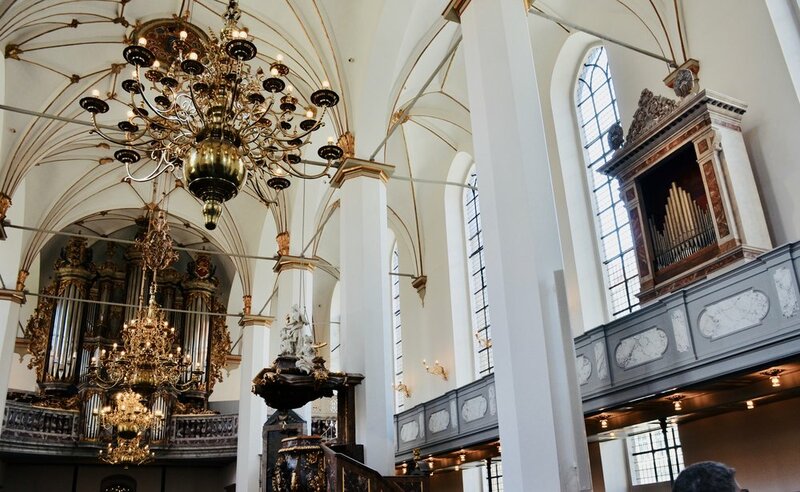 Adrian Cho plays the the Italian baroque organ in Trinitatis Kirke, Copenhagen. Adrian Cho plays the Italian baroque organ in Trinitatis Kirke, Copenhagen. 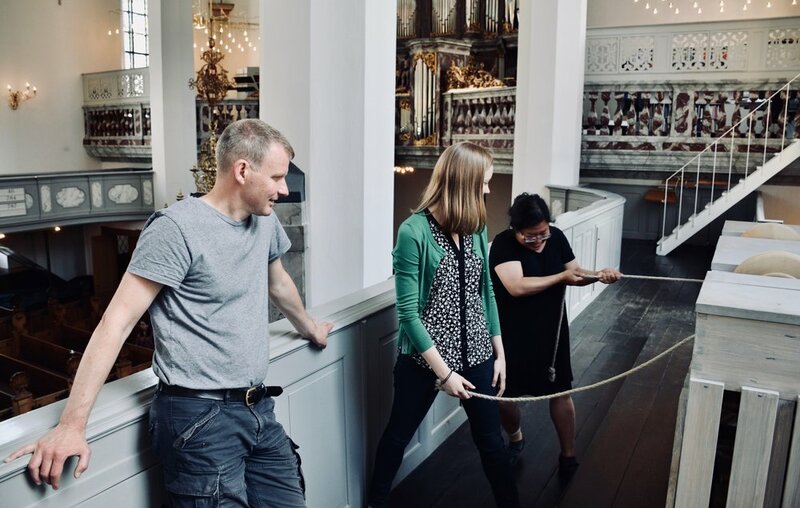 Jennifer Hsiao pumps the bellows for the Italian baroque organ in Trinitatis Kirke, Copenhagen. Laura Gullett pumps the bellows for the Italian baroque organ in Trinitatis Kirke, Copenhagen. Christian Lane and Chris Porter pump the bellows for the Italian baroque organ in Trinitatis Kirke, Copenhagen. 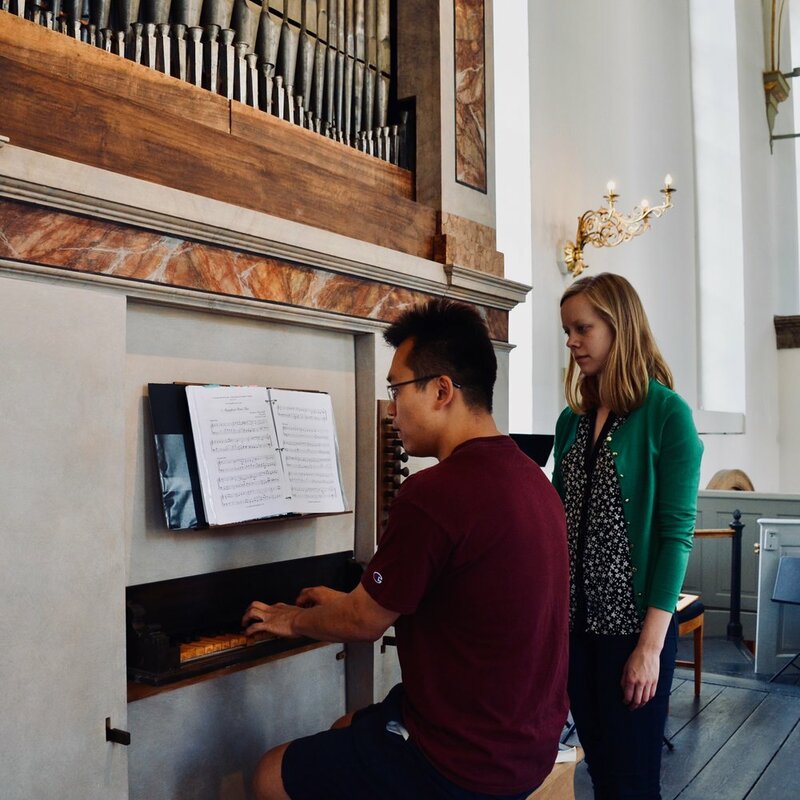 Søren Christian Vestergaard assists Laura Gullett at the Italian Baroque organ, Trinitatis Kirke, Copenhagen. 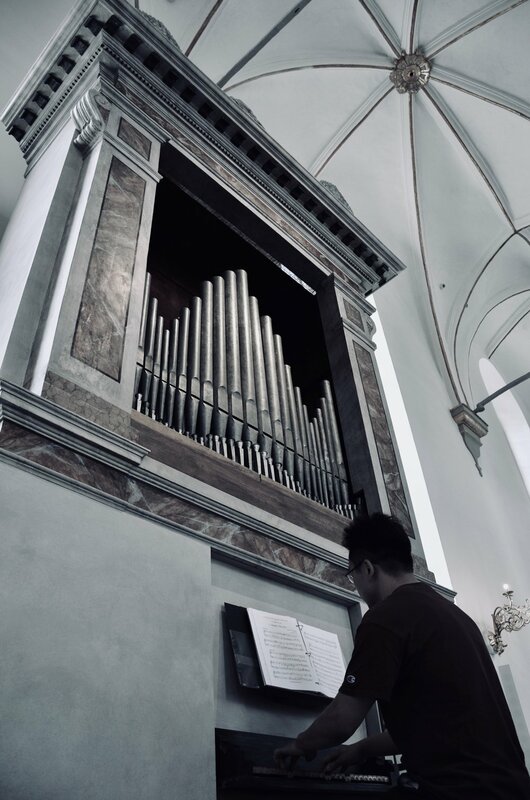 Adrian Cho pumps the bellows for the Italian baroque organ in Trinitatis Kirke, Copenhagen. 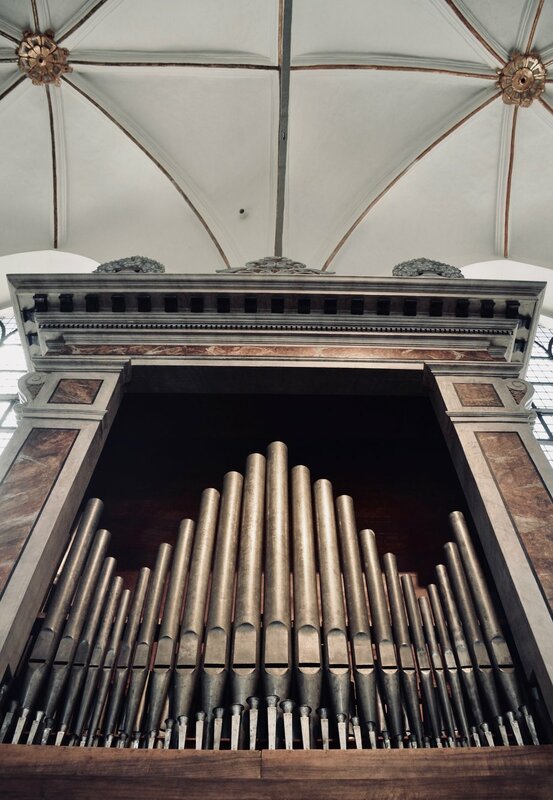 The gallery organ, Trinitatis Kirke, Copenhagen. 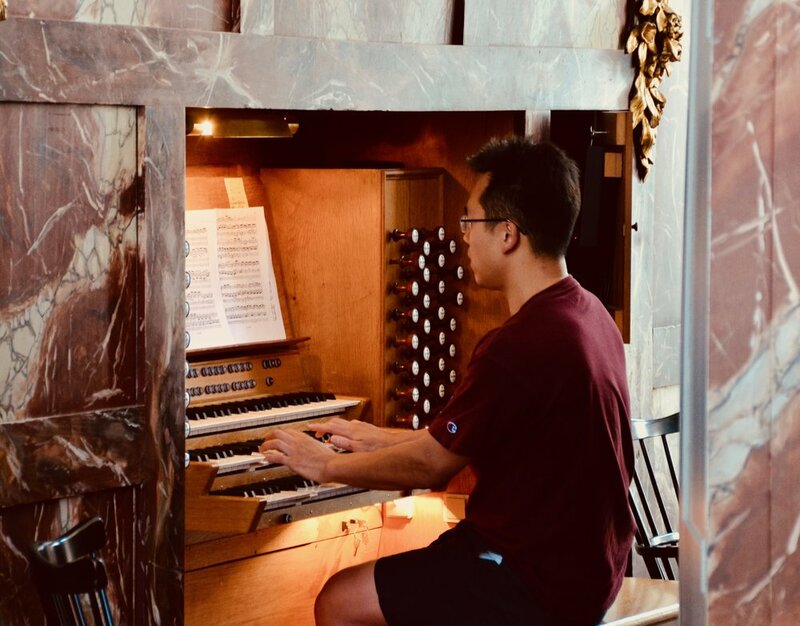 Adrian Cho plays the gallery organ, Trinitatis Kirke, Copenhagen. 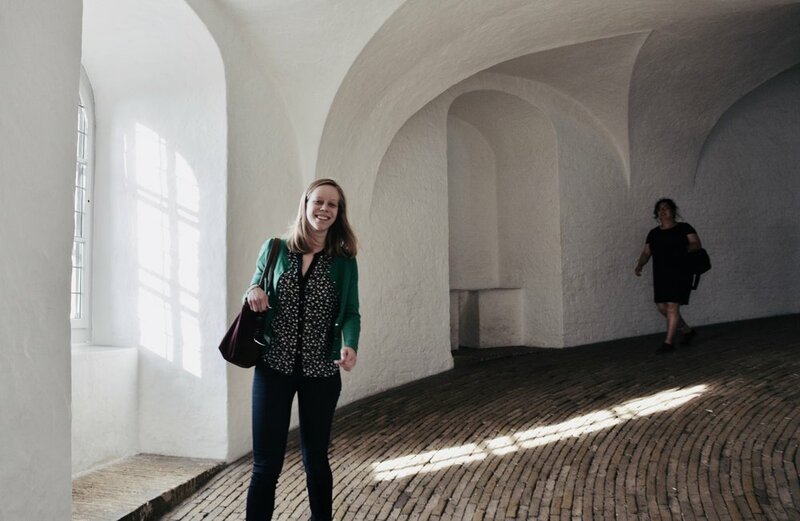 Laura Gullett is all smiles in Trinitatis Kirke, Copenhagen. 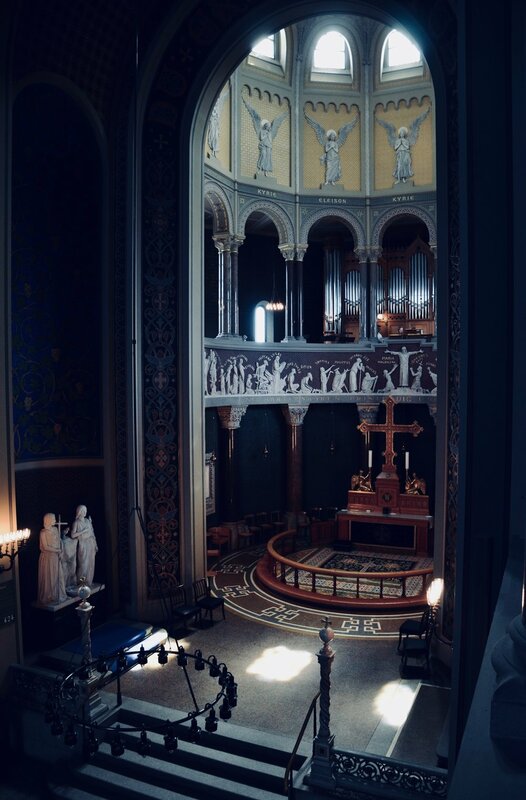 The nave of Trinitatis Kirke, Copenhagen. 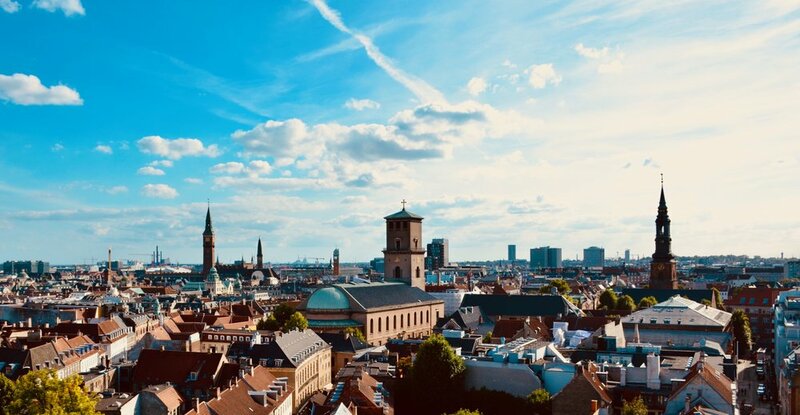 A view over Copenhagen from the tower of Trinitatis Kirke, Copenhagen. Descending the tower ramp at Trinitatis Kirke, Copenhagen, following an inspiring final day.